Are you a hardneck or a softneck kinda garlic lover? Do you know? Most of us only know the supermarket variety, which is a softneck grown for shipping qualities rather than range of flavor. Hardneck and softneck are the broadest terms used for all varieties of garlic, and there are several hundred sub-species within those varieties. We’ll look at a few of the hardnecks here, and some taste notes you might consider in growing one variety over another. A separate article will cover softneck garlic for Southern climates. All garlics are Alliums, the species sativum, and originated in central Asia. Garlics fall into two broad categories, the hardnecks which usually grow a woody, hard neck or scape in the stem center are var. ophioscorodon. The softnecks which usually don’t grow a scape, are var. sativum. The climate in central Asia is damp and cold, which the hardnecks prefer. The softnecks were later developed from hardnecks and do better than hardnecks in warmer climates. Most of the early garlic in the US came with immigrants from Poland, Germany and Italy. In 1989 the Soviet Union finally invited the Americans into the Caucasus region to collect garlic varieties. They were only allowed to travel at night (in military areas) and as they went from village to village along the old Silk Road, they named the cultivars from the towns where they were purchased. Hence, we often have a variety known by more than one name. According to many garlic lovers, hardnecks have the only ‘real’ garlic flavor although I am a garlic lover and I heartily disagree. Hardnecks are distinguished by the stiff “neck” or stalk in the center of the growing plant and they tend to have fewer but more uniform cloves around the stalk. There are three distinct groups of hardnecks: Rocambole, Purple StripePorcelain. Three additional groups have recently been added, Marbled Purple Stripe, Glazed Purple Stripe and Asiatic. Unfortunately, I found very few variety references for them. The most readily seen garlics are Rocambole and the term is often used as a generic name for all garlic. Rocamboles have thin, parchment-like skins and do not store as well as softnecks. However, they do peel easier. The term ‘serpent garlic’ comes from Rocamboles, which have curling top scapes that produce seeds called bubils. Bubils may be planted which in 2-3 years will mature into full-sized garlic bulbs. Purple Striped garlic is aptly named for the stripes which all have to some degree. The differences in Purple Stripes in taste are from mild to pungent, and in time to maturity. I have ‘Chesnok’ growing in my garden, mainly for roasting whole. Porcelain garlics have a thick, tough skin making them excellent for storing. The heads are plump with just a few large, fat cloves. Only the Silverskins (a softneck) store longer. Porcelains are all full-flavored, generally running to musky hot and pungent in taste. They are usually more expensive to buy and have the fewest cloves per bulb… sometimes as few as 4 although 6-8 is more typical. I no longer wonder where fire breathing dragons come from in Chinese folklore – they’re ordinary people who have eaten too much of the Asiatic garlics. Asiatic garlics were originally classified as a separate group that was part of the Artichoke garlics (Softnecks) but recent DNA research done independently by Dr. Gayle Volk of the USDA in Fort Collins, Colorado and Dr. Joachim Keller of the Institute for Plant Research in Gaterslaben, Germany, shows them to be weak-bolting hardnecks. ‘Polish Hardneck’, sometimes called ‘Polish Carpathian’, rich flavor, hot searing pungency that sticks around for a long time. Good hot strong long storing garlic. ‘Asian Rose’ – A strong garlic, Harvests VERY early in season – stores about 5-6 months. ‘Asian Tempest’ – A strong garlic. Harvests VERY early in season – stores about 5-6 months. ‘Korean Red’ – rich yet mellow. Harvests VERY early in season – stores about 5-6 months. ‘Russian Redstreak’, A rare early season mild garlic; delightfully mild and full flavored with only a little heat, productive, stores very well, presents a nice appearance with an excellent raw flavor. ‘Gregory’s China Rose’, Harvests early in season – stores around 6 months. – Excellent for growing in Warm Winter Areas. Rich earthy flavor. Garlic for planting should be pre-ordered now (or before late summer) to assure availability. By mid-to–late summer when I usually start to think of planting garlic, very few varieties are still available. This is an interesting article about growing garlic. I will post two more by the same author about hardneck and softneck varieties. 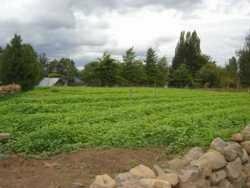 If you have any advice about growing garlic in the Inland Northwest feel free to comment. The first benefit to the home gardener is the opportunity to grow and use some of the magnificent garlic varieties seldom, if ever, found in the supermarkets and rarely even at farmer’s markets or roadside stands. Out of over 600 sub-varieties, only 2 are commonly found in grocery stores. If you like cooking and eating garlic, expand your repertoire! The second benefit (besides eating the garlic) is the growing garlic has natural fungicide and pesticide properties. Garlic companion planting is especially beneficial to lettuce by deterring aphids, and to cabbage. Garlic oil is effective at repelling and even killing snails and slugs. As well as protecting other plants, garlic can also improve their flavor. Beets and cabbage are reported to be good companions that benefit from this. However, not all companion planting with garlic is beneficial. Garlic doesn’t cooperate well with legumes, peas or potatoes so do not plant your garlic too near these. Garlic isn’t just garlic, there are many different kinds of garlic and they’re almost all different in size, color, shape, taste, number of cloves per bulb, pungency and storage times. Botanists classify all true garlics under the species Allium Sativum. There are two subspecies; Ophioscorodon, or hard-necked garlics (Ophios for short) and Sativum, or soft-necked garlics. Hardnecks further divide into Rocambole, Purple Stripe, and Porcelain sub-groups although 2 more sub-groups have recently been added: Marbled Purple Stripe and Glazed Purple Stripe. Softnecks have 2 main groups: Artichokes and Silverskins. Artichoke garlics now include the Turban and Asiatic sub-groups. There is yet another group called Creole, long thought to be a sub-group of the Silverskins but the latest DNA studies show them in a separate class by themselves. So, how do you decide what to grow? I have separate articles covering each of these groups following this article and you will find good information in them. 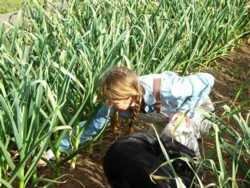 One is a general overview, this one is on basics of growing and cooking garlic, and the ones on hardnecks, softnecks and Creoles will help you decide which type for your climate and which varieties for your taste buds. Garlic is easy to grow. Great garlic is difficult to grow. Garlic developed in central Asia with long cold winters, damp cool springs and warm, dry summers. Since then it has been grown around the world and a few needs have changed. Varieties like Rocamboles still need those central Asian conditions. Porcelains and Purple Stripes are more tolerant but still won’t do well in a hot dry spring. Hardneck Rocamboles do poorly in warmer climates. Garlic tolerates most soils but if you want excellent large and beautiful garlic, you need a healthy soil full of micronutrients and minerals. High concentrations of NPK fertilizers can kill off the healthy microorganisms living in the soil, as can chemical herbicides and pesticides. “If the government requires applicators to wear ‘protective’ clothing (boots, gloves, hoods and masks) to apply it, why would you want to eat it?”  Garlic really needs the minerals and micronutrients more than an abundance of NPK. The soil should have manure and compost added on a regular basis. Rock dusts and minerals can be added; they act like long-time slow-release fertilizers and the garden will continue to maintain fertility for years to come, with fewer applications eventually needed. Garlic should be planted in the fall in the north. This gives time for sprouting roots to develop before the emerging plants die down with cold winter temperatures. After a few frosts but before the ground freezes hard in my Zone 5b, I cover my garlic bed with 6-8” of straw which helps prevent frost heave. 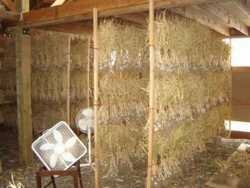 When the ground begins to warm in the spring, I remove the straw so the sun can warm the emerging stalks. Sometimes the fall planted bulbs will sprout enough to send up green shoots before winter. That’s okay… they will die back and grow again in spring. Garlic likes fertile, well-drained soil so that the bulb is above the water level and the roots deep into the moist soil. Plant the cloves root end down, about 4” deep and 6” apart in the north, and 2-3” deep in the south. Bubils (from the scapes) can be harvested and planted but they will take 2 or more years to produce a large bulb. Some vendors and growers recommend soaking individual cloves in water with bicarbonate of soda for a few minutes, and then dipped in rubbing alcohol (or 140 proof vodka) for 3-4 minutes to kill any pathogens. Use the largest cloves to grow the best bulbs for next year. If your soil is healthy and fertile you may choose (or not) to add a foliar spray in the spring. A tablespoon each of molasses, seaweed and baking soda in a gallon of water makes a good spray used 2-3 times in spring. Do not use a foliar spray on dry plants, nor spray close to harvest. The leaves will become lush at the expense of the bulb. When the tops just start to turn yellow/brown and fall over, gently dig the bulbs. There should still be some green inner leaves. When only about 8 green leaves remain, stop watering and let the soil begin to dry. After digging the bulbs, do not wash, just brush off loose dirt and store in dry shade for 2-4 weeks to cure. Treat them gently as they can bruise easily and thus not store well. Store garlic warm (55-65ºF), dry (40-60% humidity) and in the dark to keep it dormant. Garlic is usually hung to dry and good air circulation is very important. When the cell walls in a garlic clove are cut, diced, chopped, crushed, etc., the cloves release allicin which gives garlic its smell and taste. Peeling cloves is tedious but you can easily peel them without breaking cell walls by soaking individual cloves in plain water for an hour or two, or by dropping them in boiling water for 60 seconds. When you want to add garlic to a dish, the larger the pieces, the milder will be the flavor. James Beard’s recipe for Chicken with 40 Cloves of Garlic is at the end of this article. It surprisingly has the barest hint of garlic due to long cooking of whole cloves. The finer you cut garlic, the more allicin is released, creating a stronger flavor. For a bold, assertive garlic taste, finely chop or crush the garlic. Let it rest for a few minutes, and then add it just before cooking is complete. A good health practice to fight E. coli found in supermarket meats is to rub crushed raw garlic all over the meat. Crushed raw garlic is a powerful antibiotic that can kill E. coli, but it will not kill the bacteria INSIDE the meat. To do that, you must cook the meat thoroughly. I personally don’t find garlic breath objectionable. However, sunflower seed oil and parsley taken together will drastically reduce or even eliminate primary garlic breath. After eating a garlicky meal, eat a spoonful of sunflower seeds and a sprig of fresh parsley and you will find your breath much less offensive to others. When you cook garlic long and slow, it becomes creamy and less strong. Most garlic odor on your hands can be eliminated by rubbing them on a piece of stainless steel flatwear under running water. Why would anyone grow A Stinking Rose? For Garlic of Course! 1. Put the oil in a shallow dish, add the chicken pieces, and turn them to coat all sides evenly with the oil. 2. Cover the bottom of a heavy 6-quart casserole with a mixture of the celery and onions, add the parsley and tarragon, and lay the chicken pieces on top. Pour the vermouth over them, sprinkle with salt and pepper, add a dash or two of nutmeg, and tuck the garlic cloves around and between the chicken pieces. Cover the top of the casserole tight with aluminum foil and then the lid (this creates an air-tight seal so the steam won’t escape). Bake in a 375°oven for 1 1/2 hours, without removing the cover. 3. Serve the chicken, pan juices, and whole garlic cloves with thin slices of heated French bread or toast. The garlic should be squeezed from the root end of its papery husk onto the bread or toast, spread like butter, and eaten with the chicken. I have a ‘growing my own food’ obsession that comes from my overlapping interests in cooking, nutrition and gardening. I am also a “teacher”, a writer, a builder… and a craftsperson and… and… and many other things, LOL. In fact, I guess I am a generalist, and a Seeker. I live in the southern Appalachian Mountains on a hillside with a creek in front, and drive a 15 year old truck I lovingly call “My Farmer’s Ferrari.” Editor’s note: Darius passed away on March 19, 2014. Her readers will miss her greatly and we are thankful for her legacy of wonderful articles.